Mega Sale! Save 21% on the Wireless Charger Car Mount, SonRu Fast Qi Wireless Charging & Air Vent Phone Holder for iPhone X iPhone 8+ iPhone 8, Samsung Galaxy S8 S8 Plus Note 8 S7 Edge S6 Edge Plus by SONRU at All Company Mobiles. MPN: SR08. Hurry! Limited time offer. Offer valid only while supplies last. SonRu Fast Wireless Car Charger, the best 2 in 1 car charger holder, fast charging in your trip and no more tangled cords or cables in car anymore. SonRu Fast Wireless Car Charger, the best 2 in 1 car charger holder, fast charging in your trip and no more tangled cords or cables in car anymore. 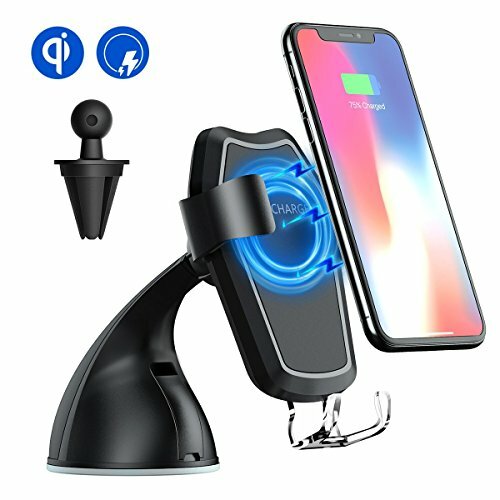 This wireless charger car mount combined charger and phone holder function. Compatible with ALL QI-Certified smartphones. Some devices may require an additional wireless charging receiver (Not Included). Air Vent installation-Suitable for most car air vent,Air vent installation way helps cool down your phone while charging. One-hand Operation-when you put your phone into it,the two sides will automatically grip your phone. Wireless Car Charger-Combined with phone charger and holder,no more tangled cords or cables in car anymore. 1.Principle: Gravity and linkage principle, only for vertical use, the wireless car charger can't placed horizontal. 2.Take off your metal ring/case, magnetic pad or over 0.5 in thickness protective case to ensure effective charging. 3.Keep your devices in the correct charging coil range. 4.In fast charge mode, QC 2.0/3.0 adaptive fast charger requires a QC 2.0/3.0 adapter as its power source. 1.Pls tear off the plastic membrane of suction mount. 2.Stick the suction mount in control panel or windshield, then put the "Lock card buckle" down. 3.Pls water-washing or wipe clean dust of suction when it get dirty. 【WIRELESS Fast Qi CHARGING】: The car wireless charger is available for Samsung Galaxy S9, S9+, S8, S8+/S8 Plus, S7, S7 Edge, Note5, Note7, S6 Edge Plus, iPhone8, iPhone8 Plus, iPhone X and all devices that support wireless charging.Those phones without Qi-function need an additional qi wireless receiver (not included). 【CORRECT CHARGING METHOD】: Take off your phone case or use slim case and adjust your phone to the best charging position. That is key important to decide your phone get the charging or fast charging. Adjust the bottom bracket there is a stretch bracket .Adjust the best position make the center of the phone at the wireless charging center (red range in the picture).Notice:It is not a battery or include a battery. 【RISK-FREE TECHNICAL SUPPORT】: Customers' satisfaction is always our top priority. This wireless charger is backed by our 3-month return guarantee policy and one month money-back for no reason. If you have any problems, please feel free to contact us! If you have any questions about this product by SONRU, contact us by completing and submitting the form below. If you are looking for a specif part number, please include it with your message.